Earn $18.40 in Rewards credit (1840 points) What's This? Inflation is just a klic away. With this sleek, modular pump's burst tank fully charged, seat and inflate your tubeless tires with the flip of a switch. 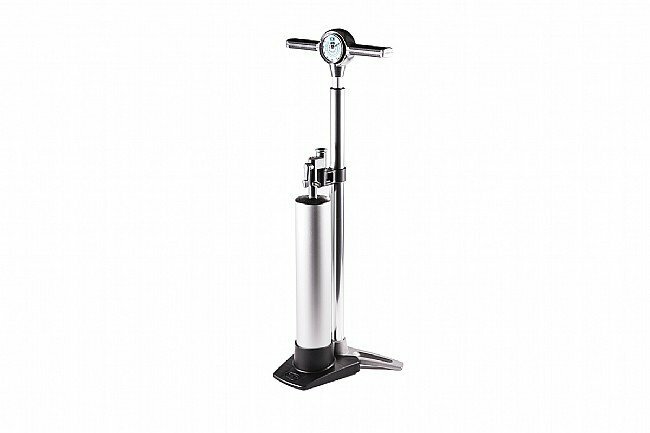 The Crank Bros Klic Floor Pump with Removable Burst Tank is a modular floor pump designed to make seating and inflating tubeless tires easy. Including a removable Burst Tank that can be charged up to 160PSI, at the flip of a switch the air will be rapidly pushed into the tire, resulting in a secure, reliable, nearly-instantaneous tubeless tire seating. Hidden hose with magnetic attachment for sleek look. Removable Burst Tank can be charged to 160 PSI /11 bar. Tripod base for added stability. Universal head for presta / schrader. Choice of analog or digital guage.